Whether you’ve got an accident claim, a medical negligence case or just want to make a will with some good estate planning, choosing the right solicitor for you is the most important decision you can make. But you’ve heard horror stories of solicitors who never get back to you or return your phone calls; who are slow and who allow things to go on forever; who speak in legal mumbo jumbo; who don’t do what they’re supposed to do; and who then hit you with a big bill that you’re not expecting at the end of it all. So, are all solicitors the same? And if not, how can you tell the good ones from the bad? How do you choose the right solicitor for you? How do you find help in making what is probably one of the most important decisions you are ever going to have to make? 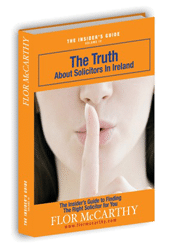 In this book I share with you my insider’s knowledge of the legal profession in Ireland; I show you how to tell the good solicitors from the bad and how to choose the solicitor that’s right for you. In this book I expose some of the worst practices of the Irish legal profession and tell you how to avoid them. I’ll tell you exactly what you need to look out for in order to find the solicitor that’s right for you and tell you, in plain English, just how the legal profession really works. I’ll explain how legal fees and charges work and demystify concepts such as no win no fee litigation.